Did I just say a few days ago that mollusks freak me out That sentiment excludes these pure, clean, fleshy gems. You don’t hear a whole lot about scallops, but in my mind, they are overlooked as a low calorie source of protein. Four ounces of scallops, at a mere 100 calories, has 19 grams of protein! I don’t know about you but I can easily put away twice that at a primal dinner of meat and plant. Scallops are also high in vitamin B12 (needed for brain function and the beloved omega 3’s. Most scallops at the store have been treated with a preservative, sodium tripolyphosphate, which makes them extra white-looking and plump annoying! The FDA requires that these scallops be labeled “water added”, or you can just ask. “Dry scallops” are untreated and have a shorter shelf life. They usually cost more, too. I never used to freeze scallops because I thought it would affect their texture. However, several weeks ago Whole Foods got in a big supply of dry scallops and was selling them for $9.99 lb. So I bought 3 lbs, divided them into 1 lb packages and froze them. I let them defrost for 24 hours in the fridge before cooking and didn’t notice that they were any different from fresh scallops. So if you find them on sale, I say go crazy and just freeze for later. Scallops, being on the expensive side, are a treat and I prepare them as such. I’ve seen recipes that call for the casual preparation of scallops in pasta sauces or taco filling but this seems like a waste to me. In this recipe they are prepared in my favorite way – on the stove top with plenty of butter. Make this once and I guarantee you’ll make it again because it is so simple and delicious. We had these for dinner last Friday night with Salad with Figs, Bacon and Toasted Pecans. You’ll likely end up with a little extra sauce but I think it is easy to overcook (resulting in unpleasant burnt flavor if you prepare it in smaller quantities. You can either store the extra sauce in the fridge for another day or use it on an accompanying cooked vegetable. Prepare the sauce. In a small saucepan, heat the vinegar over medium/medium high heat until reduced by half. Add butter and stir gently until blended, set aside (the sauce will thicken somewhat as it cools. Prepare the scallops. 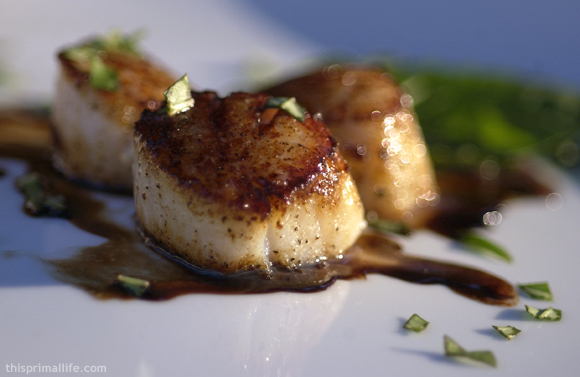 Lay scallops on an absorbent cloth or paper towel and blot off as much excess moisture as you can. Salt and pepper both sides. Heat of the butter in a sautee pan over medium-high heat until the butter just begins to brown. Gently lay of the scallops in the pan and let them cook for 2 to 2 minutes. Dont move, stir or otherwise disturb them during this time as you want them to develop a nice, toasty carmelized crust from the natural sugars in the scallop. Gently turn them over with tongs and continue to cook for another 1 2 minutes. Transfer scallops to a warm plate and rinse the pan. Repeat with the remaining scallops. Spoon sauce onto plates in fun, swirling pattern, top with scallops, and sprinkle with fresh chopped basil. Nice photo, did you take it? Thanks. No, my husband is the photographer. This looks heavenly. I have shied away from scallops at the store, mainly because of the “I can’t freeze them” issue. If you say you can freeze them and still get that nice seared crust (like you show in your pic), then I’m excited! That balsamic sauce sounds heavenly. Wow. Looks amazing. Can’t wait to try this! Very pretty picture! I love balsamic reductions, but I’ve never tried one with scallops. It sounds so good! I just tried your recipe – outstanding. Cooks Illustrated Magazine and web site recently published a technique for helping reduce the somewhat unpleasant taste of wet scallops. I tried it; it works (as do most every technique from cooks illustrated). Made scallops they came out awesome. I did substitute organic virgin olive oil in place of the butter, other than that I followed your recipe. Served them on a bed of mixed greens with baby spinach and b&m beans which I rinsed after cooking.